There's no better beer than a Royal Enfield. Make mine a Royal Enfield! Maj. Bunty Ale ("Brewed in Chennai"). These choice beers came as a Christmas gift from my daughter Anna. Each has a colorful label evoking the joys of riding a Royal Enfield (perhaps not so much with the Oil Spill IPA). 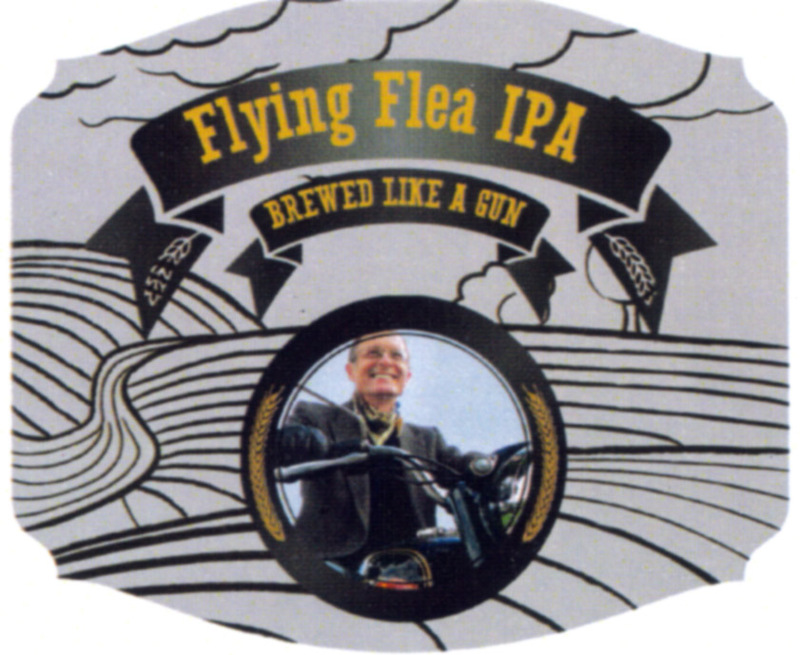 I consume them in an "official" Royal Enfield beer glass presented to me by daughter Erin on an earlier occasion. Which Royal Enfield beer to choose? Luckily they all taste the same! Would the Mad Major "Bunty" Golightly approve of the taste of Maj. Bunty Ale? That depends on whether he enjoys Yuengling Traditional Lager. Each of the six beers Anna gifted me with tastes exactly like Yuengling Traditional Lager. It's a case of badge engineering: her mother soaked the labels off a six-pack of Yuengling and Anna applied her label designs and gift wrapping. 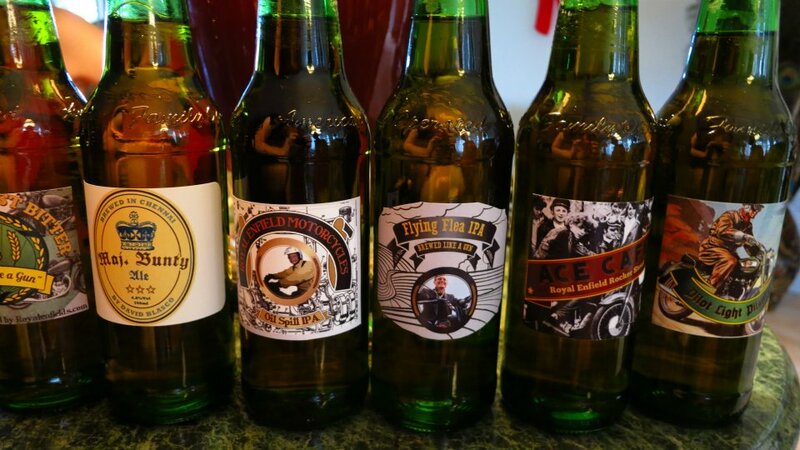 You can make your own beer labels online at Beer Labelizer or Labeley. This is the point at which you'd expect me to say "it's easy!" It's not. The web sites work well, but my efforts produced nothing nearly as neat as Anna produced. Look at the time! 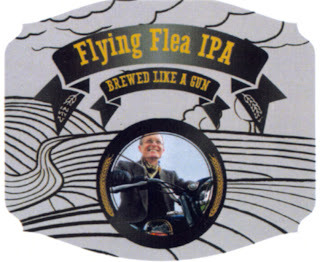 Believe I'll crack open a Flying Flea IPA. 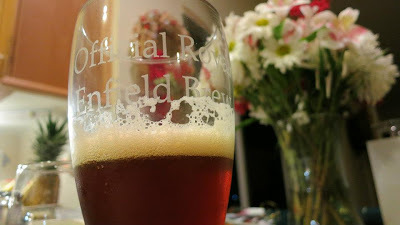 COOL...two of my favorite things;Royal Enfields and BEER...not to be used at the same time,of course! But I'm afraid I cannot endorse your ale ,fine though it may indeed be ,until I have sampled it - don't yer know . Please send half a dozen crates [ no , make that a dozen ] to Blotto Hall, Much Piddling ,Merryshire ,England , TAL 1HO . Be assured I shall give the consignment my most urgent attention . That address causes Google Maps to lock up. But I would be delighted to serve you next time you are in Fort Lauderdale, Florida, USA. I am delighted to hear from you!